Upwards of 70,000 shipowners are being forced to make decisions on how they are going to meet the new International Maritime Organization (IMO) 2020 sulphur (sulfur) emissions requirements. Which means it is crunch time for the marine exhaust gas cleaning systems (gas scrubbers) industry too. Is the industry meeting demands? Is it prepared for the spike in orders in the coming year? On January 1, 2020, the amount of sulphur ships can emit changes drastically from 3.5 percent to 0.5 percent. A lot of attention has been focused on the escalating number of ship owners choosing marine scrubbers as their solution to the IMO 2020 requirements. Daily, it seems, there is a press release about a major fleet choosing marine scrubbers as part of their compliance plan. Companies like Spliethoff, Frontline, DHT and Star Bulk, are finding the initial cost vs. payoff in their favour. In October 2018, Scorpio, one of the largest oil tanker owners in the world, agreed letters of intent to fit around 75 of its tankers with exhaust gas scrubbers. Goldman Sachs originally predicted that about 1000 ships would be fitted with scrubbers by 2020 - they now predict more than 300% that number. The scrubbers, which have flexible dimensions or modular components, can be installed within the current vessel footprint. They allow shipowners to purchase the lower-cost, more readily-available fuels and still be compliant with all the IMO sulphur regulations. The widening price gap between LSFO and HSFO is seen as a compelling business case to install gas scrubbers. The payoff can be reached in 12-18 months. In 2017, OPEC predicted a 40 percent non-compliance rate for the 2020 deadline. That prediction has been lowered to 25 percent as of early 2019. Hesitation about using LSFO goes beyond just anticipated higher prices. Ability to find fuel is also a concern. Additionally, there is the uncertainty of how the new fuels will perform in the existing engines and systems. An increase in mechanical and maintenance requirements are widely projected. But gas scrubbers allow the ships to circumvent the LSFOs completely. All these factors contribute to the surge in demand for marine scrubbers. And fast. The marine scrubber industry is aware of its production capacity limits in comparison to the escalating demands and has been extremely proactive, forward-thinking, and service-oriented as it works to meet the increasing production demands. The industry has identified several potential bottlenecks and has worked preemptively to find solutions. The most obvious need is for an increase in the workforce and manufacturing facilities. Industry-wide there has been tremendous growth in both manpower and upgrading manufacturing facilities worldwide. Companies have reported increasing production by several hundred percent already and expect to continue through the year. Pacific Green Technologies, for example, has established a joint venture with the huge Chinese conglomerate Power China, to distribute and manufacture PGT’s patented state of the art pollutant gas removal systems in China and throughout the world, in one fell swoop dramatically increasing its capacity to fit scrubbers. Elsewhere it’s been noted that another challenge is securing the steady availability of high-quality raw materials and supplemental provisions like pumps and valves. The high sulphur and salt environments are corrosive and lower grade—or poorly regulated quality-control of—raw materials could pose threats. Many of the marine scrubber manufacturers offer robust warranties, and so securing steady and reliable materials is essential and is a high priority. Another potential bottleneck in meeting production needs comes during the installation phase of the project. 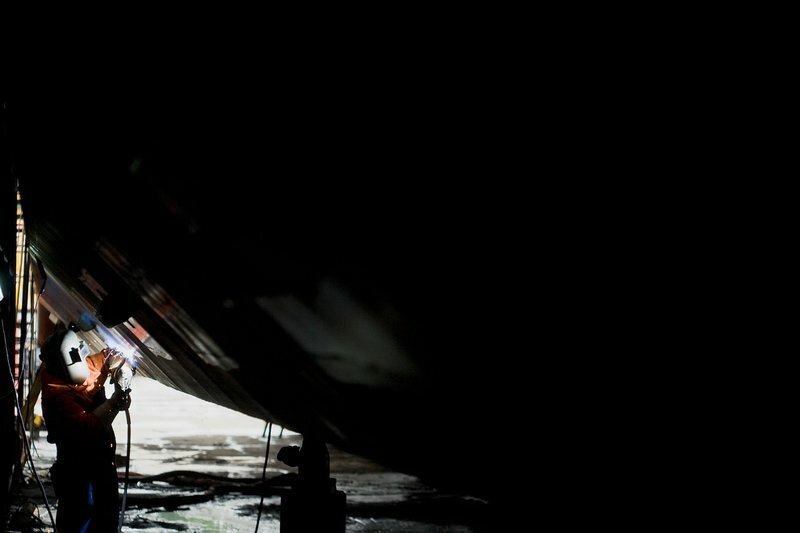 The scrubber manufacturing industry has been uniquely accommodating to its clients in its goal to limit the downtime and ease the logistical challenges of retrofitting a ship with scrubbers. It is possible for shipowners to select shipyards worldwide and have the parts and installation team come to them. This also reduces the strain on securing yard time. The Exhaust Gas Cleaning Systems Association (EGCSA) believes that there are enough shipyard spaces to accommodate ships wanting to retrofit with scrubbers. However, they note, the lack of availability of critical experts, like laser-scanning specialists, might be the more likely obstacle. Changes in financing also play a part in the supply and demand balance. As shipowners, fleet operators, and lending institutions see the attractive payoff times, it’s becoming easier to get approval and funding for the upfront retrofitting costs of marine scrubbers. It is yet to be determined whether the marine scrubber industry will be able to keep up with the surging demands for orders by the 2020 deadline. Even predicting the number of units likely to be ordered by the deadline is in itself a challenge. However, the marine scrubber industry has shown that it is proactively identifying challenges and implementing solutions to grow the production capacity of the marine scrubber industry in the run-up to the 2020 sulphur emissions limit. The marine scrubber industry is ready - are you?